On Friday evening, we decided to take a break from Niagara Real Estate and do some shopping at the Pen Centre in St Catharines. We had something to eat in the London Arms then went to see a movie. We watched nearly all of the movie with just 10 minutes left to go when the fire alarm sounded and we were all ordered out of the building! Having stood around outside for 20 minutes with no sign of fire or emergency vehicles, we established it was a false alarm but by then, the staff advised they were locking up and we would have to come back another night, get complimentary tickets and watch the movie again! So what happened in the last 10 minutes of Runner Runner? Having had the evening cut short, I wondered what we should do for the rest of the weekend. My wife suggested we go to Hamilton for the day on Saturday and ‘get to know it better’. To be honest, I was not impressed with the idea (sorry Hamilton) but as I had no better suggestions, I agreed! Saturday morning – up early as Sandra was going to the hair dressers. I went to an Italian café a few doors along and had a Cappuccino – very good it was too. We left there then got on the QEW for the 40 minute drive to Hamilton. It was an overcast but warm day as we came off the highway and took the old Highway 8 into downtown. 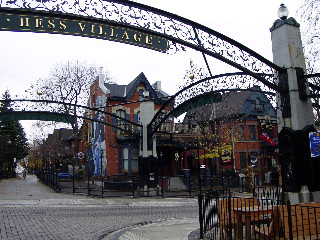 Hess Village – A lively, downtown area with lots of bars, nightclubs, live music, etc. More of a night destination than mid afternoon but was still worth a drive-by. 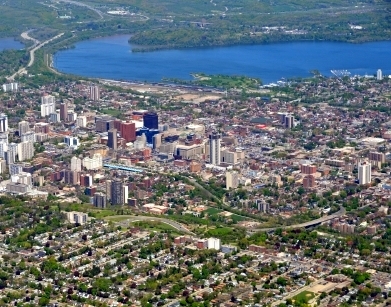 Popular area for students by night, also an area of older, high end homes. Locke Street – A tree lined, well established, older area with nice restaurants, cafes and boutique shops, surrounded by substantial, Victorian brick homes. Downtown – Nations Supermarket. I know a supermarket does not seem exciting but this one is a bit different! This large and fairly new store has all the usual things you would expect, but also carries a huge selection of Asian foods, has a great seafood room with a huge choice – the best I have seen in southern Ontario – and also a huge and very busy food court with lots of unusual items. Imagine Hong Kong meets Hamilton! As we left the downtown area, we headed towards the waterfront area. Worth a visit is Bayfront Park – a very large park surrounded on three sides by water, formerly a major industrial site, it is now very picturesque. Around the bay is Pier 4 Park which has a similar history. During the summer, there are tour boats and there are numerous marinas. Having enjoyed our day, it was now time to head home. I think we will visit Hamilton again soon! 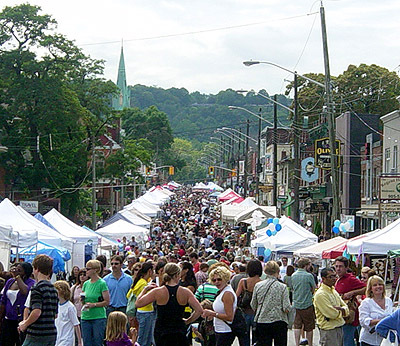 Making the move to NOTL or at least thinking about doing so? just get in touch with me, Kevin Stokes, at Niagara Homes and I will be very happy to help you. This entry was posted in Blog, Uncategorized on October 8, 2013 by wp_admin.